Route accesible for people with reduced mobility. Saturday April 6, 2019 at 9:00 am from Olot. To collect the number it is necessary to collect at leats 1.500€ of donations and have registered the 6 members of the team. The teams can register and modify until March 31. Incomplete teams will not be able to participate. Limited places. Registration deadline: March 31 or 400 teams registered. 50km in less than 16 hours through Massís de les Gavarres and Vía Verde of Girona. Positive slope: 639m; negative: 710m. Saturday April 6, 2019 at 12:00am from Celrà. To collect the number, it is necessary to collect at least 1.500€ of donations and have registered the 6 members of the team. 100€ per team of 4 walkers + 2 support crew with a vehicle. Limited places. Registration deadline: March 31 or 200 teams registered. Please download the Roadbook (in spanish) and the english translation. On Sunday, March 24th, the 6 members and the mobile phone of each participant that will be used during TW have to be included on the web. At the offices of DKV, Paseo de Gracia 55 6th floor, from 9:00 am to 8:00 pm with the signed team card (download it from your web profile with the final data). Before Sunday, March 21, enter on the web with your username and password to make the equipment changes and verify that the mobile numbers are the ones that you will use during the TW. From that date we will issue the definitive lists and, for security, we con not accept changes. Download and sign the card with the members and final mobiles number and bring it signed. If a team has not been able to complete the 6 participants before the previous Sunday, they will not be able to participate. In case of injury, you must present the accident part to the insurer to recover the cost of the health care recived. Do a previous sports medical examination and follow the precauciones sanitarias(spanish) and the advice of alimentación(spanish): There will be water and fruits in all the check points and some other product with wich some companies collaborate, but the main sustenance (breakfast, lunch, dinner) should be provided by the support team. The Start point of the 100 Kilometers is on Saturdat at 9:00 am: the greenway will be open to the public.The time of greater affluence of Saturday is from 8:00am to 10:00 am. You should be cautious, patient and share the road with cyclists and walkers. The departure of the 50 Kilometers is from Celrà on Saturday at 12:00 am. The route of the Trailwalker runs through natural areas that we must preserve and conserve. Do not throw garbage, use the selective collection containers located at the control points. Let's leave the route cleaner than we found it! Use the WC located at the control points. All the marchers of the team must go through the controls together, including the Start. Participants who do not pass through any of the controls will be automatically disqualified. The opening and closing times of the control points are calculated for a minimum total time of 9 hours and a maximum of 32 hours. The teams that do not reach a control point before its closure will not continue. Below you can find a summary of the location of each of the Trailwalker check points and additional information related to the facilities that will be found on each of them (provisioning, toilet, rest area). We strengthen the health service with medical assistance, physiology and podiatry. 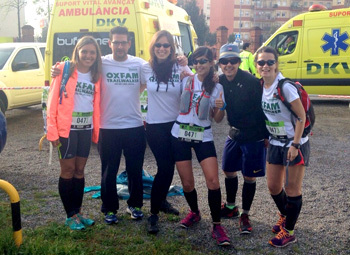 Prevention: we recommend a prueba médica deportiva before a great effort like the Trailwalker. Ambulance in all the check points: 8 medical care teams in the controls of the route, health care vehicles and the 24h career doctor facilitated by the main sponsor of the event, DKV Seguros. A team of physiotherapists made up of professors and student volunteers from the Faculty of Health Sciences Blanquerna, will be available to runners who request it in Girona and a team of nurses from Blanquerna will reinforce podiatric cures and other injuries in Cassà. Other professionals from the Col·legi de Podòlegs de Catalunya will also attend the participants in Girona and Llagostera.